The wasps are dead. On Friday evening, I finally opened the door to spray the nest. They were not active but there were 3 of them sitting on the entry to the door. They all turned and looked at me. I swear, they did. I broke the seal on the wasp spray and unloaded. It was dripping. A couple of them took off to the south as soon as the spray hit the hole. I'm pretty sure I drowned one of them just by the sheer quantity of fluid I sprayed into the area. I closed the door and let it be. There wasn't a reason for me to be out front other than to get the mail, over the weekend. 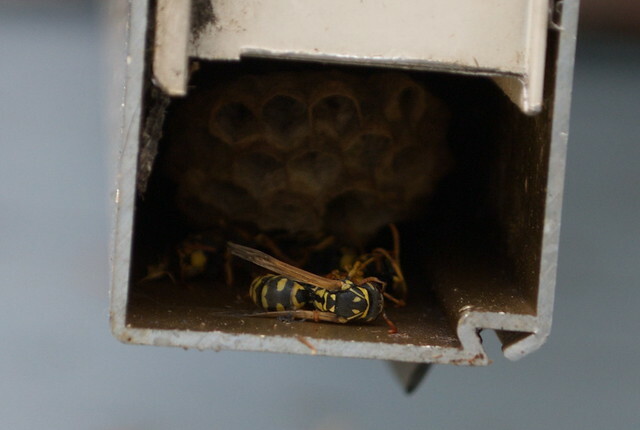 Last night, while getting the mail, I noticed the absence of wasps, so I opened the door as far as it would go, propped it open and took a look. There is one body by the entrance and two under the nest they were building. I took a stick, broke up the nest and pulled it out of the door. It really wasn't very big, maybe a bit bigger than a cherry tomato. Perhaps it would not have become any bigger than that this year. It was about 2 inches inside the door, too, not very far. I do know, however, that left undisturbed, the nest tends to grow each year. I could see it extending all the way from the front to the back and my not being able to completely clear it out without getting stung. In a way, I was a bit sad at having to forcibly and fatally evict them. Yellow jackets prey on caterpillars and other insects which helps keep their populations in check. It's all tied together. They like spiders but can, if caught in the web, become spider food. They are not a pollinator specifically and would only pollinate plants accidentally if going after an insect which was on a plant to start. As long as we leave them alone, they will leave us alone. The problem lies in building a nest inside my front door. Then they have to be forcibly encouraged to move. I hosed the place down after removing the nest. I'm hopeful they won't be back.